I thought some of you might be interested in how I wallpaper the inside of a gourd. First is to seal it. I seal it with Selleys PVA+ exterior Aquadhere glue. Allow to dry. 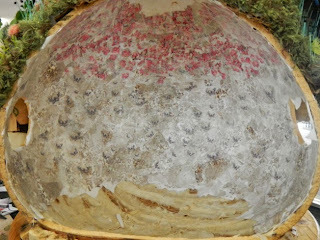 The reason for doing this is that the gourd can leach a brown stain into the wallpaper, this prevents this from happening. Second - Take plain white paper, I use art (acid free) paper and tear into small scraps (the size of 2-3cm piece) and glue all over the gourd surface. Do two layers. Allow to dry. Third - Find a paper that you would like to use as the pattern for your wallpaper. 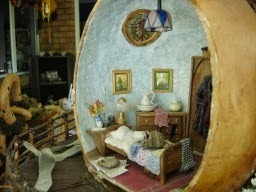 The paper used for Archibald's bedroom was a paper and pattern made especially for miniature work. I chose that one because of the pattern it had no lines or defining areas. 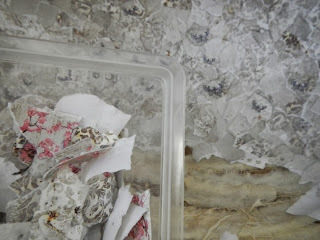 When it came to the lounge room of the room I have just finished in the hanging house I have used scrap-booking paper. These papers are interesting in that they are made up of layers. Taking these layers apart means that you can get both patterns, the one on the back and the one on the front. 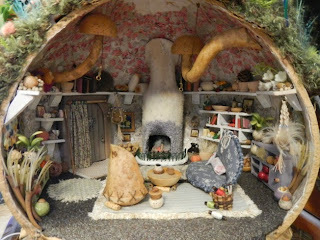 This is Archibald's Bedroom and I have covered the walls with a wallpaper especially made for miniature work. This was the first time I had used wallpaper. Glue the paper allover the white paper. As can be seen from the image below I have placed the pink flowers that were on the base of the paper I chose on the top of my room. Even though the paper looks scrappy it has turned out beautifully. I shall put up a photo of the completed room as soon as I can. This is the completed room. I'm extremely pleased with it. It is completely different from the style I am used to. I am now working on a little girl's bedroom. 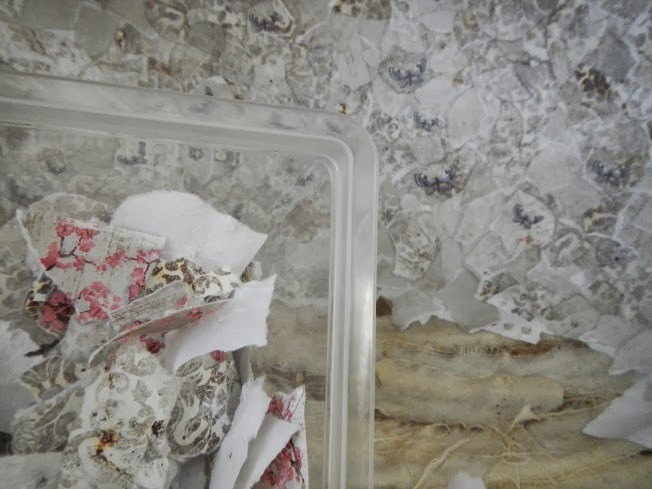 I am using wallpaper and beaten mulberry bark to decorate the walls.